Consumer behavior is always evolving and the shifts are particularly impactful for those in the restaurant delivery world, where that behavior is so closely tied to technology and convenience. As food delivery proliferates, people’s preferences are changing, perhaps to the advantage of the restaurant operator. A majority of quick-service and fast-casual customers prefer to order directly from a restaurant website or mobile app versus a third-party service, a notable finding from Tillster’s Delivery Index study. Tillster, a digital ordering and restaurant engagement company, partnered with research firm SSI to survey 2,000 QSR and fast-casual customers on their delivery habits and preferences, finding more than 55 percent of them want to use the restaurant’s website for delivery, while only 8 percent prefer a third-party site. According to Tillster’s Chief Marketing Officer, Hope Neiman, the survey results indicate more consumers are moving past the “discovery” phase of using various aggregators to try different restaurants to the “when I want that brand, I want it to be easy and direct” phase. “If people become more familiar with delivery and ordering online, they’re choosing their favorite restaurants and that’s the brand they think of when they’re ready to order again,” says Neiman. For restaurants, the advantages are owning the customer data and controlling the customer experience, both of which are key to remarketing and retention. Providing returning guests with convenience features, such as reorder tools or prompts to add items they’ve chosen in the past, also enhances the visit. Customers report they would order from their favorite restaurants one extra time per month if delivery was offered, and more than 70 percent of QSR and fast-casual customers said they would choose a restaurant more often if delivery were offered. The importance of delivery doesn’t apply only to millennials. Of customers 35-44, around 78 percent said they’d increase their number of orders if a restaurant offered delivery, while more than 50 percent of customers 55-64 would order more often from a restaurant with delivery services. 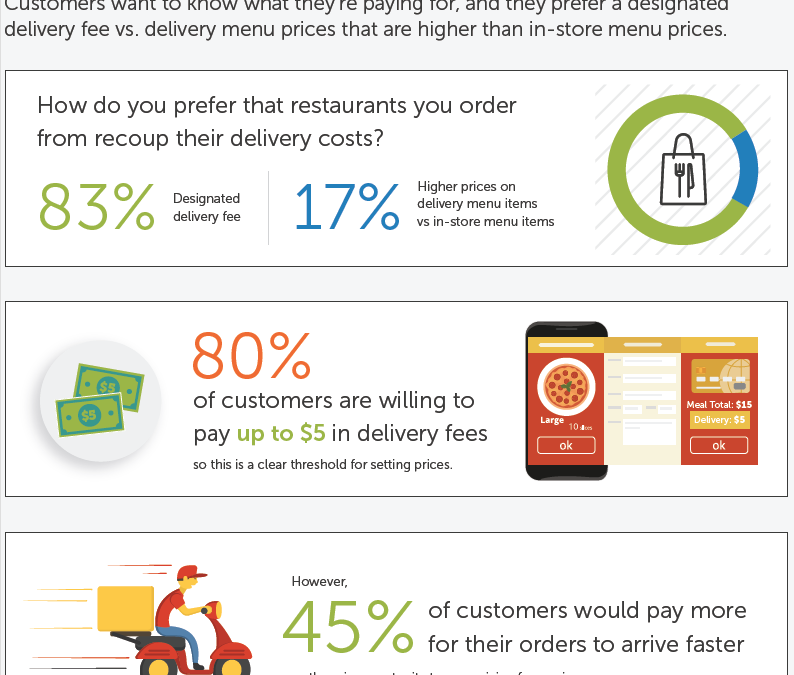 When it comes to delivery fees, customers want to know what they’re paying for, with a whopping 83 percent preferring a designated delivery fee instead of higher delivery menu prices. The $5 fee mark emerged as a clear threshold for setting prices, with 80 percent of customers saying they’d pay up to that amount in delivery fees. However, points out Neiman, 45 percent said they’d pay more for their orders to arrive faster.